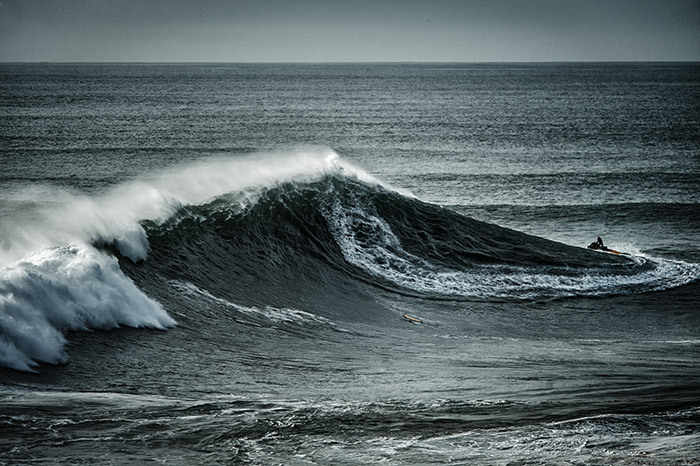 Jannuary 28th 2013 – Garrett McNamara rode probably what was supposedly the biggest wave in surf history ever. Was it 100 feet tall? Well, we don’t know (yet). But at least it was higher than it was thought to be possible just a few years ago. And GMAC is convinced: There are bigger waves coming than that. Garrett McNamara’s start into life at first didn’t look like one of the greatest surfers of our times was born. He grew up in Massachusetts – far off regions known for surfing. If it wasn’t for coincidence and his mother’s plans to move to Hawaii, he would probably never have become a surfer at all. And if it wasn’t for a teenager friend when Garrett was 16 he might have become merely an ordinary surfer. “In my early youth I had ridden just small waves because I was scared of anything bigger than 6 feet. When I was 15 I vowed to never surf waves over 6 feet. And then this friend forced me into bigger waves, he literally dragged me there – and suddenly I loved it. And everything started from there,” he remembers. At that time, big wave surfing was a totally different deal. Watermen used to ride huge boards, 12 feet and even longer, to reach enough speed by paddling to actually catch the wave. 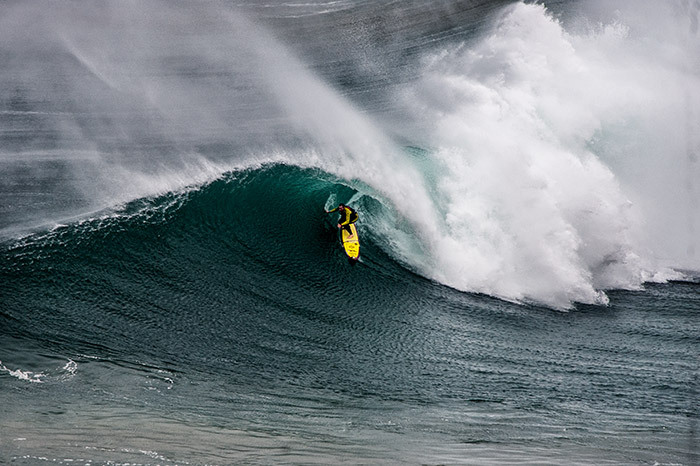 The rule is simple: The bigger the wave, the more speed you need to actually catch it. Then a limit of 12-15 metres was considered the max what was surfable and was reserved for the strongest paddlers only. Garrett was soon becoming one of these wild guys: a strong paddler who went bigger and bigger since he got hooked through the experience with his teenage friend. Then in the nineties a group of pioneers started using motorboats at first and just a little later jetskis to get beyond the limitations of paddling power. The motor driven speed made it possible to catch even bigger waves. This also effected board size: Suddenly smaller boards specifically for tow-in surfing came up. Modern big wave surfers ride boards that are much shorter than old big wave guns. Riding waves in that height was made possible by jet skis: They drag the surfers into the waves – and are capable of rescuing surfers out of the devastating white waters. It seemed the only restrictions left were the human body and the incredible powers such big waves generate: A wipeout on a 20 metre wave meant to be almost torn apart, getting dragged up to 16 metres under water, sometimes being held down for a minute or two. “Well, every surfer has his personal comfort zone and with good preparation you can extend it. You can get more secure, better equipped with material and also mentally prepared and suddenly you find yourself in bigger surf, surfing better, having more fun. 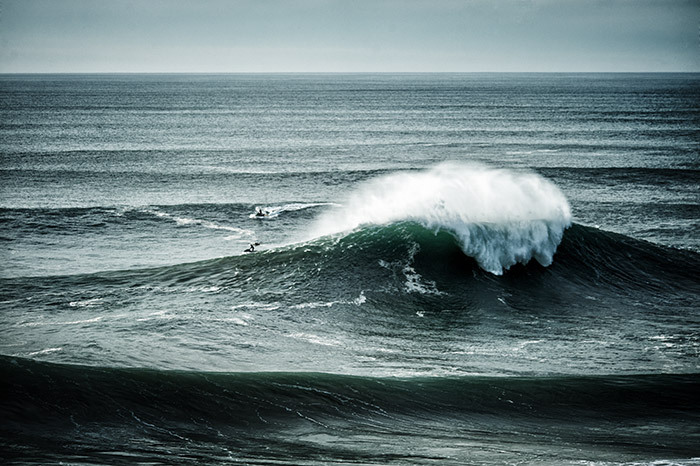 To have fun in bigger waves depends on you and doing your homework.” says McNamara. Even though the scene of big wave surfers was eager to find even bigger waves, Nazaré was not a famous big wave spot for a long time. In 2010 Garrett McNamara – by then a globally known extreme watermen – was about to change that. Nazaré is a small village on the Portuguese coast with white buildings, narrow streets, a long beach and a lighthouse set on a rock above the city. In summer, the beach and the lazy atmosphere attract over 100 000 people, whereas in winter it gets calmer with a mere population of 10 000. And after years of being just another beach town, the town hall invited Garrett McNamara to explore their odd sight: Giant waves. Standing there, looking at a natural phenomenon like this simply puts you in a state of awe. Actually you just get dull and dizzy, as the beauty is really hard to grasp. It’s fair to say giant waves aren’t something special: At all times they form and break somewhere. However, giant waves which aren’t just breaking as avalanches of formless white water are exceptionally rare. A strong swell is just one part of the equation. Nazaré as a location adds a certain ingredient which can be found on just a few places world wide. 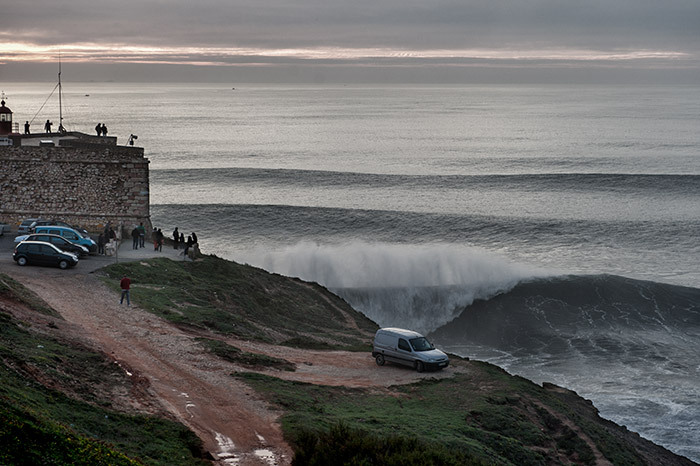 It is incredible in the sense that just a couple of miles north and south of the village, waves reach just regular size, whereas at the same time in Nazaré mutant waves appear. The reason for this is an irregularity of the ocean floor: the so called “Nazaré Canyon”. It’s an ocean floor valley up to 5000 metres deep and reaching 250 kilometers out into the open ocean. Arriving swells get caught in this canyon, the waves propagate over the canyon at different speeds, converge with each other and the rock formations compress and lead the swell directly to the lighthouse of Nazaré. There, the depth suddenly decreases to just a couple of metres and all that wave energy piles up and forms those ridiculously huge waves. The Nazaré Canyon is an irregularity of the ocean floor: swells can pass through the canyon without any resistance while getting compressed at the same time. The result: huge giant crazy mutant waves. Nazaré in action, Garrett in action: He was the one who made Nazaré famous. 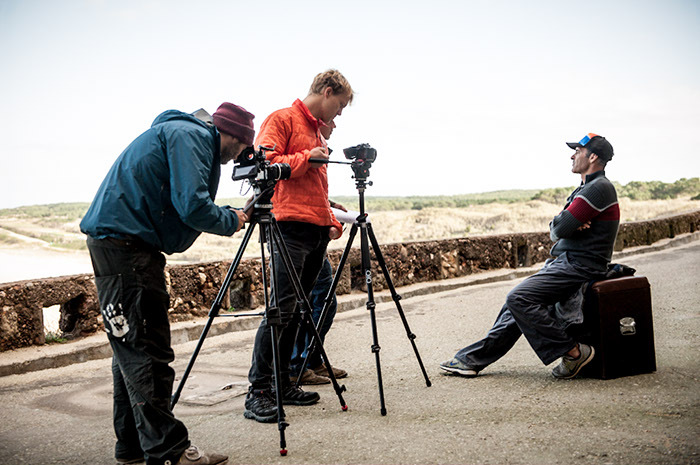 Camera teams (like ours) are a common sight and the inhabitants greet Garrett on the streets. He’s a local hero. 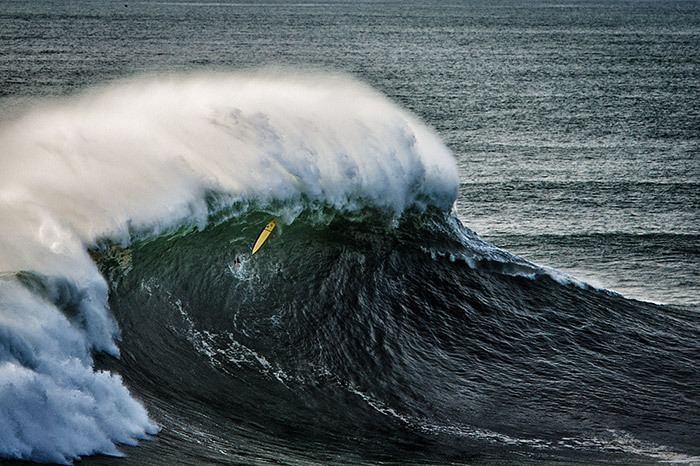 McNamara spent the last 3 winter seasons in Nazaré to wait for the right moment. Surely the town has changed since his first arrival: The world record wave from 2011 had put the little town on the map and into the consciousness of the surfing world. Tourism has increased, especially in the winter when the huge swells arrive and the attraction of the town – the waves – can be seen from very close distance. Wipe outs on waves like this are not an inconvenience, they are a threat for your body, mind and life. Garretts custom made wetsuit features a whole lot of flotation and protectional pads to minimize risks. 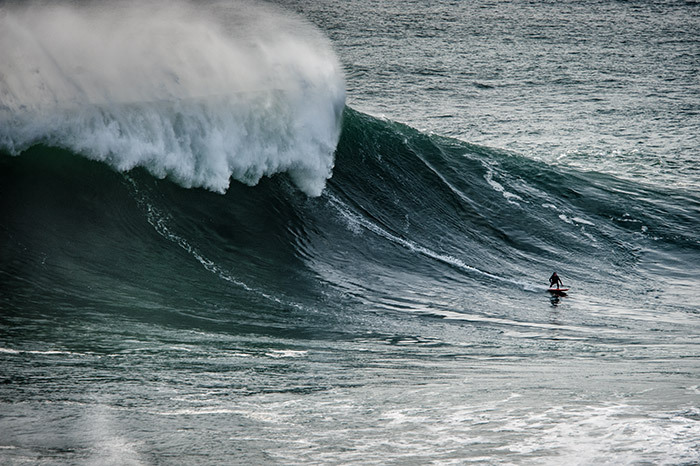 Staying in Nazaré – it’s not over yet!